Pyramid shaped Pisang Peak is situated at an altitude of 6,091 meters (19,980 ft.) in the famous trekking route of Nepal at Annapurna Region. Pisang Peak Climbing follows the Annapurna Circuit Trekking Trail. From Pisang Village, the peak climbing paths get separated for 5 days, summit the Pisang Peak then rejoin the Annapurna Trekking Route. 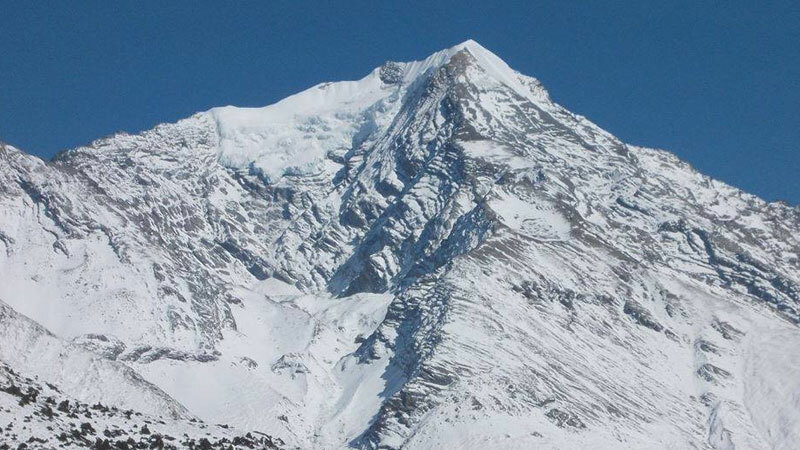 From the top, one can have a mesmerizing view of lofty snow-capped Annapurna Massif like Mt. Manaslu, Gangapurna, Lamjung Himal, Tilicho Peak, Annapurna I, II, III, and IV, and much more junior mountains. Being smallest trekking peak, Pisang Peak Climbing is considered as the easiest peak climbing in Nepal and gaining popularity among beginner. It doesn't require hard training and can be summited without technical knowledge but must be physically fit. Pisang Peak was first summited by a German expedition in 1995. The journey begins with a five hours scenic drive to Besisahar from Kathmandu. Stay overnight in this beautiful village and next day morning drive to Chame. This is the trekking beginning point to climb Pisang Peak. Hike to Upper Pisang, climb to Base Camp, High Camp, and finally summit the Pisang Peak. Then descend down to Manang, cross the highest trekking pass, Thorong La Pass (5416m), visit the sacred religious Muktinath Temple and exit the trek via flying from Jomsom to Pokhara. Finishing the trip drive back to Kathmandu. Day 03: Trek to Upper Pisang. Day 05: Trek to Pisang Peak Base Camp. Day 06: Trek to High Camp. Day 07: Summit Pisang Peak and back to Base Camp. Day 09: Trek back to Manang. Day 10: Trek to Leder. Trail Attractions: Wonderful views of Tilicho Peak, Gangapurna, Annapurna II, III, and IV. Day 11: Trek to Thorong Phedi. Day 12: Cross Thorong La Pass and trek to Muktinath. Drop to your hotel and Pisang Peak Climbing Trip finished here! Breakfast, Lunch, and Dinner during Trekking & Climbing. Twin bed sharing teahouse/lodge/tented camp accommodation during trekking/climbing. Jomsom to Pokhara Flight Fare. Wants some modification on Pisang Peak Climbing itinerary? contact us to customize it.